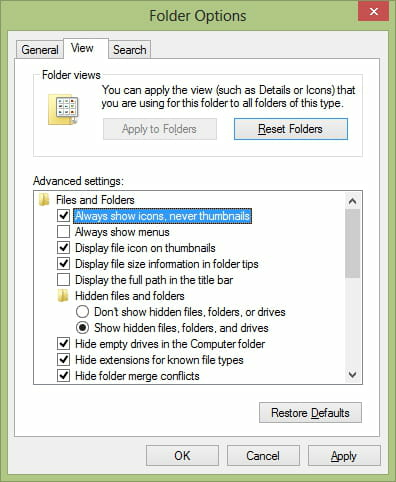 Windows 8 - How to get rid thumbs.db files? You work with a lot of multimedia files (pictures, videos, mp3 files) and as result your PC is full of thumbs.db files. How to prevent Windows from creating these files? In "Files and Folders", simply check the button next to "Always show icons, never thumbnails"
Published by deri58. Latest update on June 24, 2013 at 05:46 AM by deri58. This document, titled "Windows 8 - How to get rid thumbs.db files?," is available under the Creative Commons license. Any copy, reuse, or modification of the content should be sufficiently credited to CCM (https://ccm.net/).